Japanese beauty brand Annayake has launched Kimitsu, a new fragrance duo. Kimitsu for Her ~ a fruity floriental with bergamot, pear, tuberose, rose, red fruits, orange blossom, pink pepper, amber, musk, patchouli and vanilla. In Eau de Parfum. 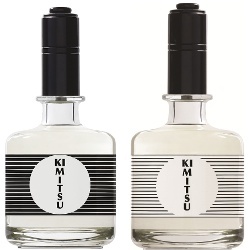 Kimitsu for Him ~ a spicy woods with citrus, pepper, mate, spices, neroli, vetiver, cedar, amber and woods. In Eau de Toilette. The Annayake Kimitsu fragrances are available in 100 ml at Douglas in Germany. I really like the sound of Kimitsu for Him. It does sound nice, and Annayake does nice bottles.